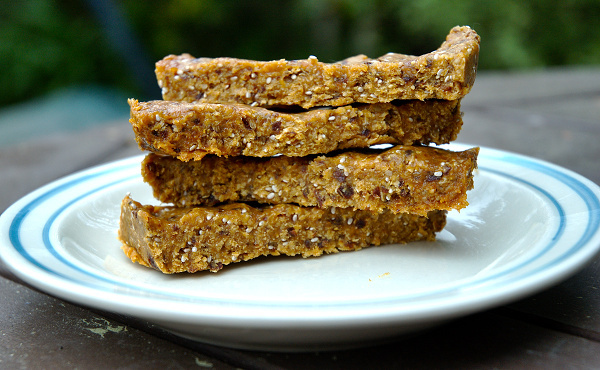 Fit to Blog: Vegan Maca Bars - Introducing Try It, You Might LIke It! Vegan Maca Bars - Introducing Try It, You Might LIke It! I've put a new section up in the recipe tab called 'Try It, You Might Like It!' This is for all those quirky one-off things I invent just throwing things around in the kitch (sometimes literally, judging by the state of my cupboard doors). These are the 'anyone could think of it' recipes, that may not be particularly unique or recipe-book worthy, but that rocked my tastebuds on a random Sunday. For Raw Vegan Maca Rounds (a popular variation) Click Here. Soak the prunes in water for about 10 minutes. While they are soaking, melt the honey and coconut oil in a saucepan over low heat. Drain the prunes and process them along with the almond meal, oat bran, salt, maca and chia seeds until everything is a sticky mess. Add the arrowroot and melted coconut butter/honey to the mix and process until everything is combined. The mix is very sticky! The best thing is to dump it onto baking paper, cover with another sheet and press it flat. Or, you can use my method: vinyl food handling gloves. Nothing sticks to those. Once flattened to your desired height, put your creation in the freezer for about an hour, then move to the fridge. Cut into bars and munch! I just got back from a walk to check on the progress of "my" supermarket, and the Maca bar was a delicious end to a smile-inducing walk. The New World near our house has been closed since Old Bucky delivered a wrecking-ball from below in Feb 2011. It was heartbreaking to witness the demolition, but I've processed that. I'm over it. I've moved on. The new supermarket is an earthquake-proof, shiny piece of architecture that is easily three times the size of the old one - how exciting!. It's not particularly innovative or beautiful (it's a supermarket, not a dream home), but I don't care; it's within walking distance. If it was already open I'd be shooting 'down the road' for another jar of coconut oil to make a fresh batch of Maca Bars. 20 metre foundations? That's great, but mostly I'd like to know the size of the organics section. Why isn't that info in the public updates? I'm interested: what is your favourite shop spot? If that was suddenly taken away, would it be a major inconvenience, or no big deal? Comment me! That looks like a Lara bar. Did it taste like one? A bit. Lara bars are mostly dates and I don't use them much - mainly because pitting them is a bit tedious. What suburb are in, in Chch? Oh yes I get so excited by new supermarkets.... particularly ones with a good organics/health food section! I'm excited to get back to Chch and see all the changes from the last time I was home. Seriously, I love it when you bake VEGAN.... these sounds delicious, and once I get rid of evil evil candida I will try for sure! What is a g? In the states we use cups of 1 or 1/2 etc. Hi Sara - finally bought some maca powder. Have you made further innovations to the recipe apart from skipping the honey and not having to soak the prunes? I don't have a food processor so I guess I'll be using old fashioned muscle...Would buckwheat flour or rice flour be a good substitute if I don't have arrowroot powder? Thanks for the great recipes. I'm wondering if these bars will help the hot flushes. The maca capsules didn't do anything though! Yes, I think you could use any flour, or even just leave it out. I've discovered that pretty much any combination of dried fruit/nuts/seeds (or even just dried fruit) works. 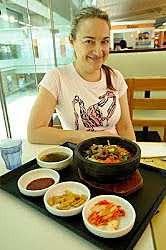 I think if you chop everything very small you'll be fine, but it will be a lot of work! I also know that tupperware make a hand operated device that mushes dried fruit really well. My mum has one. That would totally do the job. With Maca, I can't vouch for any brand except the one I sell and there is a lot of variation in quality, unfortunately. I would also recommend taking a 'less is more' approach with the Maca - you can overdo it if you jump in with too high a dose.